HIALEAH, Fla. -- At a presidential campaign event for Mitt Romney Tuesday, Mario Diaz-Balart, a congressman from Florida who endorsed Romney, got into a debate with the Miami Herald's Marc Caputo when the reporter laughed at his comments during an interview. Caputo asked Diaz-Balart about President Obama's foreign policy record, and when Diaz-Balart suggested that recent successes in the Middle East and Africa were a result of Bush administration policies, Caputo chuckled. That's when Diaz-Balart went off. 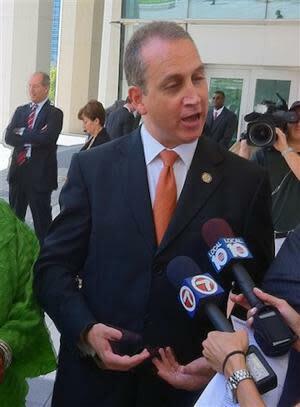 Diaz-Balart: "You laugh, are you a reporter or a debater? . . . It's funny because--and I'm not giving you a hard time here, but usually reporters are reporters, not advocates." Diaz-Balart: "Oh yes you are." Caputo: "Give me an example of advocacy,"
Diaz-Balart: "Right now! You're laughing about my position. . . .You're an advocate! By the way, you have the right to be. I love advocacy." Caputo: "I disagree with your characterization of advocacy." Diaz-Balart: "You're in advocacy. You're an advocate." Diaz-Balart: "And I completely respect your advocacy, I do. I respect your advocacy." Caputo: "I respect your right to get it wrong that I'm advocating." Caputo: "We'll agree to disagree." Diaz-Balart: "And I respect you when I give a point of view that you disagree with, laughing about it." Caputo: "I don't know why you think I disagree with it." Diaz-Balart: "You laughed about it." Listen to the rest in the audio recording. The spat begins about three and a half minutes in.